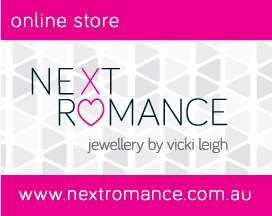 "NEXT ROMANCE" are pleased to announce you can touch and feel a selection of handmade jewellery pieces at a monthly market stall in Melbourne, AUSTRALIA. Vicki Leigh is a contemporary jewellery artist, working primarily in polymer clay. Exploring the versatility of clay using surface treatments like print transfers and lace impressions with an emphasis on colour in contemporary and everyday adornment. Her collection promises playful earrings in all shapes and sizes, sculptural bangles, bright statement necklaces and hand-formed clay brooches for anyone that appreciates the handmade and unique. Vicki Leigh Jewellery is inspired by celebration, laughter, fun and friendship.